Tues 730 pm: Kevin of Always Home and Uncool let me know that Tilda Swinton was filming a scene in front of Dairy Inn in the Springdale shopping center about 6:30 p.m. Evidently they had been there all day. Here's a really terrible pic he sent me. Hey, it's better than nothing! Wed 8am: My friend emailed me this pic of a fake travel store front RIGHT beside Vinny's, the go-to burger place for people with young kids. 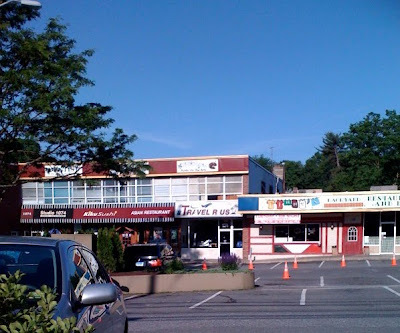 Wed 10:30am: a friend posted on facebook that they were filming INSIDE Vinny's! I'll have to ask them about it next time I go there. Wed 1:25 pm: Kevin let me know that they were still filming out by the Dairy Inn as of 1 p.m. He didn't see Tilde or JCR. They were setting up a shot with a guy in a wheelchair. Wed 9pm: a reader posted a link yesterday afternoon on my previous post about my botched attempt to stalk the movie set at it's location at Wright Tech, letting me know they were filming inside CVS Springdale. It really stinks that I have a JOB, or else I could properly stalk this movie and report back to you! You know, like when I first started this blog. That was an idyllic time. Now I have a JOB, which I love, but it keep me really busy. I'm doing a major (and really cool) writing project with my students, so I'm busy at work keeping track of them, and I need to get myself into bathing suit shape for a friend's wedding in late summer- oh and plus there's my BABY, who can now CLIMB ONTO ALMOST ANYTHING, and he's really fast, so virtually nowhere is safe. I'd be OK with that, but I'm afraid he's going to break his arm like one of our baby friends did. I didn't know that babies could like, break their arms. Looking forward to this summer, when I'll have a little more brain space for blogging, and the baby and I are going to be out and about a lot, so we should be able to have some adventures. Just 5 more weeks of school left! It's been a great half-year with my students, actually. They've done some excellent writing, and that always makes me very, very happy. We really *Do* Need to Talk About Kevin. How many trips to Dunkin' Donuts can Kevin withstand in one day? Kevin, can you drive the minivan when your arms are vibrating from all the iced lattes? Sorry about that photo. All I had was my camera phone. The black-dressed female blob in the center is TS. Drove by the AM. Trucks are still there, catering set up some of the equipment is still in the lot but covered by tarps. The Travel R Us sign actually looks vaguely like something that was once in the shopping center 20 years ago. Cool. What's shaking at the Strawberry Hill DD today?